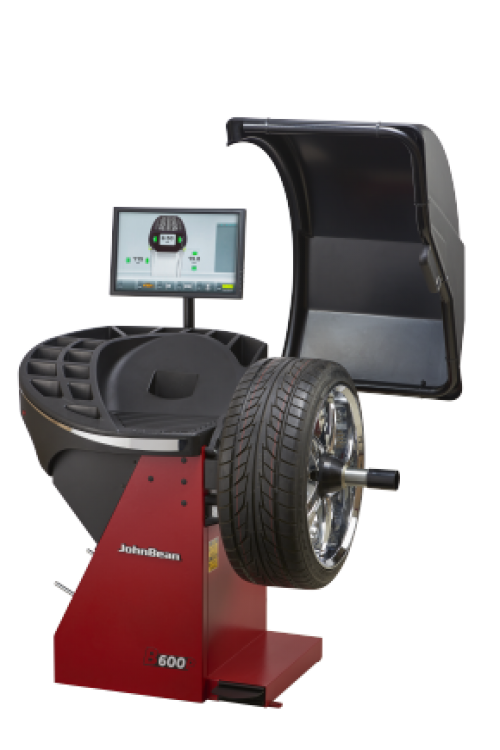 The B600 series wheel balancing systems are designed for high volume shops. Its intuitive user interface and ergonomic touchscreen reduces complexity and offers short cycle times. Touchscreen with Advanced User Interface - Fast and easy selection of commonly used modes: spoke detection, match mount and manual mode. Large, easy to see measurement results and bright indicators for weight position. Smart Sonar - Automatically calculates wheel width and detects offset. The balancing cycle is started as soon as the wheel guard has been lowered. 30% time savings compared to manual input. Patented Automatic Power Clamp - Electromechanically clamps the wheel accurately with a constant force reducing the opportunity for chasing weight. easyWeight - Pinpoint laser accurately indicates the positioning of adhesive weight on the wheel, avoiding misplacement. Weight location is ergonomically indicated in the lower rim position. LED Wheel Lighting - All B600 series wheel balancing systems come with a bright LED lighting system that facilitates rim cleaning and aids in the weight positioning process.